Millions of fans around the world tuned in this past weekend to see two undefeated heavyweight kingpins put everything on the line at the Staples Center in Los Angeles. While Wilder vs. Fury lived up to the hype inside the ring, the controversial decision left many with a bad taste in their mouths. Deontay Wilder has been the WBC heavyweight champion since January 2015 when he beat up and dominated fellow American Bermane Stiverne en route to a unanimous decision victory. ‘The Bronze Bomber’, was 40-0 with 39 KOs leading into the fight with Tyson Fury, including 7-0 with 7 KOs defending his WBC title. The challenger, Tyson Fury of the UK, became the WBA (super), WBO, IBF, and lineal heavyweight champion after out-boxing long-time champion Wladimir Klitschko in Germany back in November of 2015. Unfortunately, following that career-defining victory, Fury’s life went downhill. Depression, along with heavy drinking and drug use forced him to give up boxing. Though he had lost his belts, ‘The Gypsy King’ remained the lineal champion and brought with him that distinguished title going into Wilder vs. Fury. Although Wilder had faced a bit of adversity at times (like in his fights against Artur Szpilka and Luis Ortiz), he would always eventually come through and put his opponents away. He was the betting favorite for good reason against Fury, who had looked less than himself against ‘tune-up’ opponents Sefer Seferi and Francesco Pianeta. For the fans, there were many interesting storylines going into the bout. None were more compelling than the comeback of Tyson Fury. In his two-and-a-half year hiatus from the sport, Fury had ballooned up to over 400 pounds while dealing with mental health issues. Less than six months after making his return against the aforementioned Seferi, Fury would be taking on one of the most dangerous fighters in boxing history. Great movie material, but only if he came out victorious. The buildup was entertaining, and both fighters attempted to get in their opponents’ head. Neither man looked noticeably rattled or fazed by the trash talk, but fans knew that Wilder vs. Fury had the makings of a heavyweight classic. Two undefeated, proud giants were about to square off for the prestigious WBC title. This was certainly the most anticipated heavyweight scrap on American soil in quite a while. The fight started off as many do, with both men trying to find the range with their jabs. Wilder made the first aggressive move, lunging in with an overhand right and left hook, neither of which landed. Fury then proceeded to tie Wilder up to avoid damage, and continued on to outbox Wilder for the rest of the round. Most of the first eight rounds were very similar, with Fury using his footwork and head movement to avoid taking Wilder’s devastating punches while simultaneously landing more quality shots of his own. Although Wilder may have won one or two rounds prior, it was not until Round 9 that he had any significant success. The 33-year-old Alabamian came out aggressively and within the first minute he landed a series of punches that resulted in the first knockdown of the fight. Fury was not seriously hurt though, and he got up and survived the rest of the round. The Brit then won the 10th and 11th rounds to grow what looked to be a sizable lead as Wilder appeared to be fading. The 12th round brought the biggest moment in the fight. Deontay Wilder finally landed the shots he was looking for all night. A little over thirty seconds in, Fury was hit with a strong right hand while ducking and Wilder followed it up with a flush left hook right on the button, sending Tyson Fury to the canvas. At that point almost everybody watching believed the fight was over, including myself. 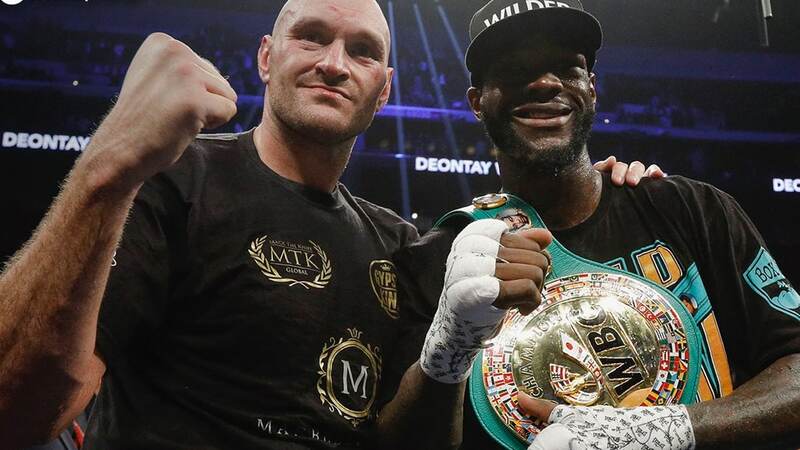 Wilder did a little dance as if to say ‘told you so’, but he was forced to stop his celebration as Fury miraculously got back up to his feet, barely beating the count. As soon as referee Jack Reiss resumed the fight, Wilder went for the finish, landing a solid left hand, but he was unable to follow up before Fury once again tied him up in a clinch. Wilder went for the knockout once more but was unsuccessful, even allowing Fury to land some good shots of his own to finish out the final round. After the fight, both fighters appeared confident that they had won, though it was Fury who seemed more satisfied with his performance. Judge Alejandro Rochin (Mexico) scored the fight 115-111 for Deontay Wilder, judge Robert Tapper (Canada) had a score of 114-112 for Tyson Fury, and judge Phil Edwards (UK) had things even at 113-113. The result was a split draw. Wilder would keep his WBC title, and Fury would remain the lineal champion. For most who saw the fight, this was a highly controversial decision. After predicting a Wilder knockout beforehand, I scored the fight 115-111 (9 rounds to 3, including two knockdowns) for Tyson Fury. If I had to summarize the fight: Fury out-boxed and frustrated Wilder for most of the night aside from a few moments where Wilder’s speed and power got to him. Many had Fury winning 10 to 2. Former #1 P4P boxers Andre Ward, Gennady Golovkin, and Floyd Mayweather all had Fury winning as well. 78% of those who voted on Showtime Boxing’s post-fight Twitter poll had Tyson Fury winning despite getting knocked down twice. Wilder vs. Fury was a great fight, there was action, drama, and even a lot of showboating (by Fury). Without a doubt this event brought many more fans to boxing. If it was back before, the heavyweight division is definitely back now. It is just unfortunate that after his unique (to boxing) comeback story, Tyson Fury was not able to hold up the WBC title and solidify his place in the history books. Make no mistake, Wilder is an elite fighter with world class power and explosiveness, and he proved a lot of doubters wrong, namely Fury fans, who thought this would be an easy win for the Gypsy King. However, on the night he was simply outclassed by a supremely gifted boxer. I predicted an early stoppage win for Deontay and I would still favor him in a rematch. Because of the two knockdowns, this was not a huge robbery, but it was still, in my opinion, yet another head-scratcher of a decision. And bad decisions like this in huge events hurt boxing every time. Nevertheless, boxing and the heavyweight division in particular are on the rise, and there are some great fights to be made in the future, including a Wilder-Fury rematch. Comment below with what you thought of the fight, the decision, and how you think a rematch would play out. This bout was decided in a fair manner by ending in a draw. In the first (5) rounds I gave two them to Wilder plus the two rounds where he scored knockdowns. My scorecard had Fury up (8-4) in rounds, however, the (2) knockdown rounds were scored (10-8) making it a (112-112) final score for a Draw.